Everyone deserves to live life to the full. The Physio Girl aims to help you feel better, and achieve your goals in a positive and fun environment, through Physio and exercise. Hi my name is Eimear, I am a mum of two and a passionate physiotherapist specialising in women’s health. I have a first class honours Degree in Physiotherapy and am Pilates trained with the Australian Physiotherapy and Pilates Institute. Life brings with it many challenges. I am passionate about helping you feel strong and healthy. At The Physio Girl I offer a comprehensive assessment and treatment of each individual, and specialise in pelvic floor health for women of all ages. I first saw Eimear shortly after my first child was born, when I hurt my back at an exercise class and sought a recommendation from a friend. Eimear fixed the problem I had with my back and explained that I had a severe diastasis recti and had been doing exercises that were not safe for me. Noone had mentioned this at my post natal checks and I had no idea. Eimear helped me to rehabilitate my diastasis and showed me how to protect it so I returned to normal exercise intensity. Eimear has treated me in her physiotherapy clinic during my two further pregnancies and her post natal classes have helped me to safely return to exercise each time. With her guidance I know how to modify exercises to protect my core and I have been able to resume HIIT training and my couch to 5k, which I never would have dreamed was possible when I saw her first. 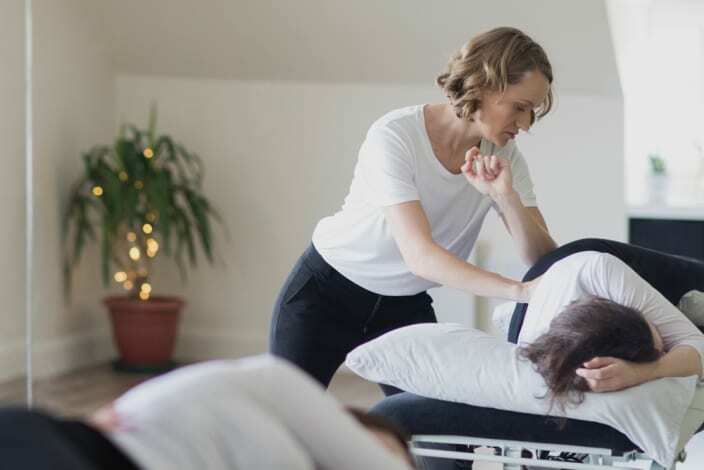 I wouldn’t hesitate to recommend Eimear to anyone needing physiotherapy services, and most especially to anyone seeking an excellent womens health physiotherapist.